The Outre Eye Of Daniel Xiii: Beneath, The Human Race, The Twilight Zone Essential Episodes and Septic Man! A pair of big-rig truckers, one a crusty old veteran, the other a college-educated youngster, team up to haul cargo across the country. Was this really funny, or was I just young? 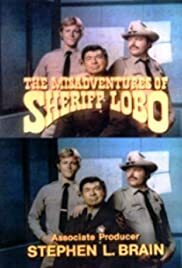 All I know is that my family watched Sheriff Lobo and enjoyed it quite a bit. It's been so long since I've seen an episode that I can't bring any real specifics to mind, but I know I always looked forward to Perkins' antics, week by week. Of course, my taste in television wasn't critically-acclaimed, by any means. I watched the Dukes of Hazzard, religiously, but I never had much feeling for B.J. and the Bear. It was only recently I found out this show was a B.J. spinoff. It would be nice to have this on TVLand (since there's no longer a TNN to show reruns of hick shows) so I could see if it really WAS any good.